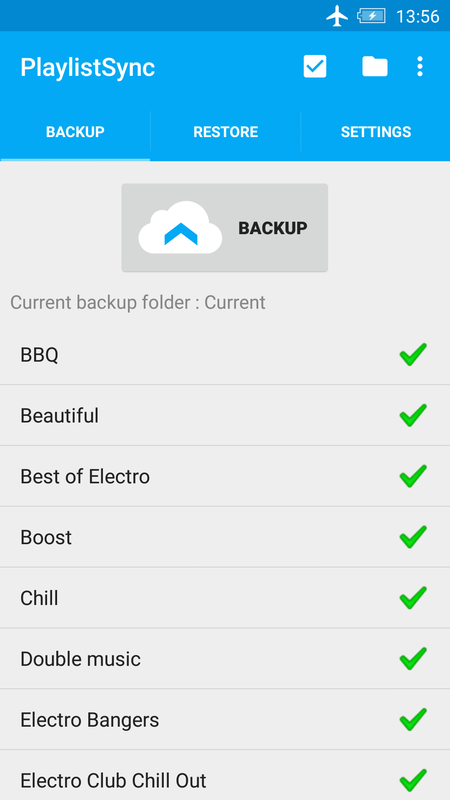 A backup can be triggered in one click and is executed in background with a progress notification. A restore as well, you'll just need to swipe before clicking "Restore". There's a path substitution option if you have devices with different storage paths. It saves your playlists to your Google Account. Does it save my music ? I can't see my playlists ! If you use Poweramp, Google Play Music, RealPlayer or some other player, this is perfectly normal. They use their own playlists systems and PlaylistSync won't support them. 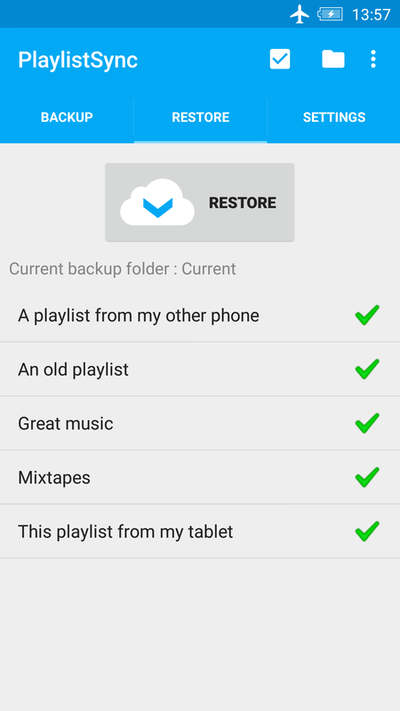 You can try to convert these playlists with the Playlist Backup app. How should my music files be named ? 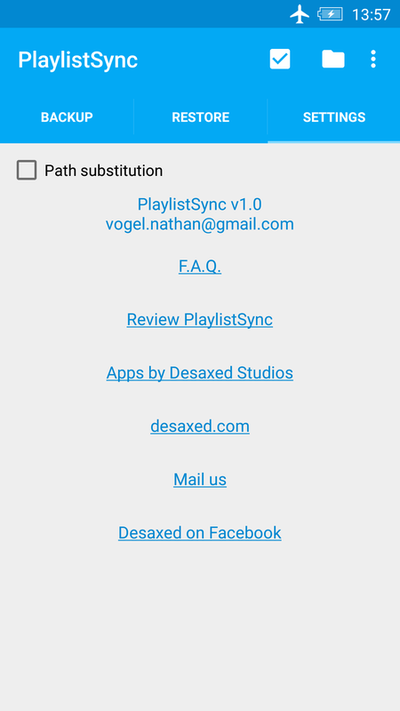 Else, you'll maybe have to use the Path substitution option to make sure PlaylistSync finds the correct audio files on different devices. 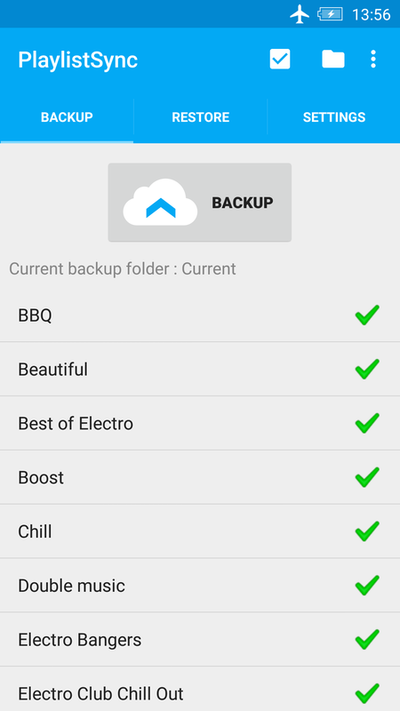 Can I save multiple backups of the same playlists ? Yes, just change the backup folder (Menu → Choose backup folder). If you don't change the backup folder, previous backup files will be overwritten. When should I bother with Path substitution ? - You have multiple audio files with the same name. Where are the backup files ? The files are stored on your Google Drive. They're basic text files with the .playlistsync extension. Can I move these files ? Yes, but you'll have to do Menu → Choose Backup Folder → Select the correct folder to find them again. Can I delete these files ? Yes, but you'll lose your backup. Your audio files must have the same file names on your different devices.